At the first time frozen forages have started to be made for Aquarian fishes in large quantities in America in the early fifties. Already in the first year of sales they with success have pressed the trade market live forages. The main reasons of such launch of sales is convenience of storage of a forage, and the guaranteed safety from infection of the aquarium with different pathogenic organisms. Occurrence on sale of dry feeds only has not shaken sale of frozen forages, and has strengthened their consumer appeal. The basic advantage in comparison with dry feeds is of 100% the natural origin. At correct selection of a live or frozen forage the food allowance of your fish is most possible approached to food base biotope origins of a kind of fishes. As it is known the primary goal of any is creation at home particles natural type which in accuracy would reproduce an environment of dwelling for your kind of fishes, thereby, providing with it normal growth, reproduction and colour colouring. Professionals all the world have made the choice, and already more than 50-years with success using of the frozen forages at feeding of the fishes. Today it is very difficult to find a pet-shop where on sale near to dry and so forth forages would not present frozen forages for aquarian fishes. Only in Europe are more than 40 firms of frozen forages engaged in manufacture for Aquarian fishes. These are such known firms as RUTO, AMTRA, Katrinex, BENKER"S, Aquaristik, Frostfutter-spezialist, PETMEN and others. In our market of the zoo goods they began to appear on sale since 2001, every day taking steadier positions in the market of forages for aquarian fishes. Firm Aquaria has been based in March 2001. The basic direction manufacture of forages for aquarian fish. 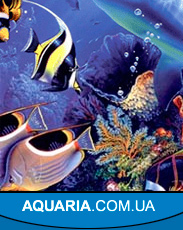 All forages Aquaria are made of natural raw materials, without what or chemical additives. All raw materials on our manufacture pass careful selection and the veterinary control. Our diets are developed for aquarian fishes at active participation of leaders professionals in Ukraine and Russia. Base forages and mixes are prepared by a method super deep frosts at -50C with preliminary processing by ozone. Forages look like a chocolate. Packing weight 100 g. Water is added only in the quantity necessary for prevention of oxidising processes at the moment of freezing and the legend of the form of a chocolate. We are the first who have started to pack frozen forages for aquarian fishes in vacuum packages. Vacuum packing - consists of 5 layers various on structure of barrier films which, supplementing each other prevent penetration of air and moisture from an environment thereby, interfering with oxidation, development of micro organisms and putrefactive fungi in a product. Periods of storage thereby in comparison with other kinds of packing are increased in 2 times (under condition of storage-18S). Many owners in Russia and Ukraine are already familiar with forages Aquaria numbering more of 20 kinds, both base forages, and various special mixes. 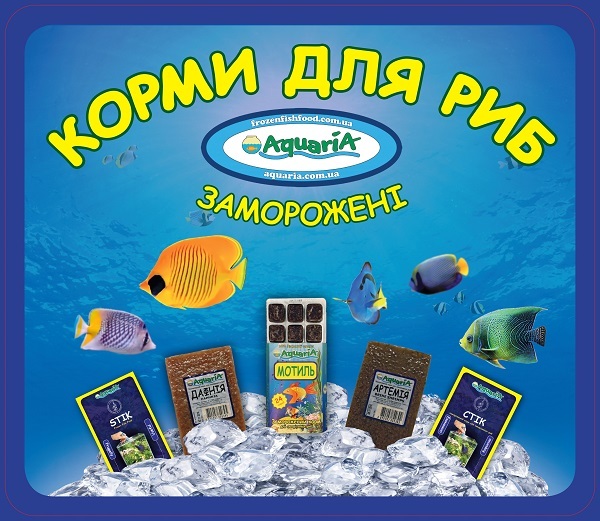 For three years of existence in the market, the considerable quantity of positive responses from aquaristes Ukraine and Russia has been received.